Professional-quality color for an exceptional value—up to 16,000 pages per cartridge1 at an ultra-low cost per page. Get outstanding results every time with extra-high-yield cartridges designed and engineered for HP PageWide Enterprise devices. Avoid wasting time troubleshooting device issues, using consistent, reliable Original HP PageWide cartridges. Replace cartridges quickly and correctly with easy-open packaging and simple, fast installation. Print professional-quality color on a variety of papers—consistent, reliable, and perfect for office use. 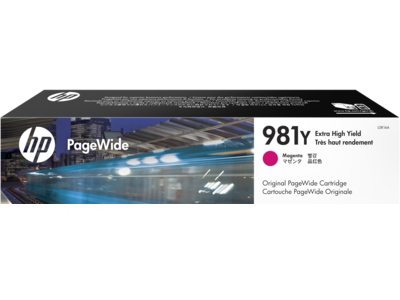 footnote1 Yield based on ISO 24711 cartridge yields for HP 981Y Extra High Yield Original PageWide Cartridges. Comparison based on ISO 24711 cartridge yields for HP 981Y Extra High Yield Original PageWide Cartridges compared with HP 981 series Original PageWide Cartridges. Learn more at http://www.hp.com/go/learnaboutsupplies. footnote2 HP Web Jetadmin is available for download at no additional charge at hp.com/go/webjetadmin. footnote3 Tested in HP PageWide Enterprise Color MFP 586dn. Average continuous composite (cyan/magenta/yellow) yield based on ISO/IEC 24711 or HP testing methodology and continuous printing. Actual yield varies considerably based on content of printed pages and other factors. For details see www.hp.com/go/learnaboutsupplies.